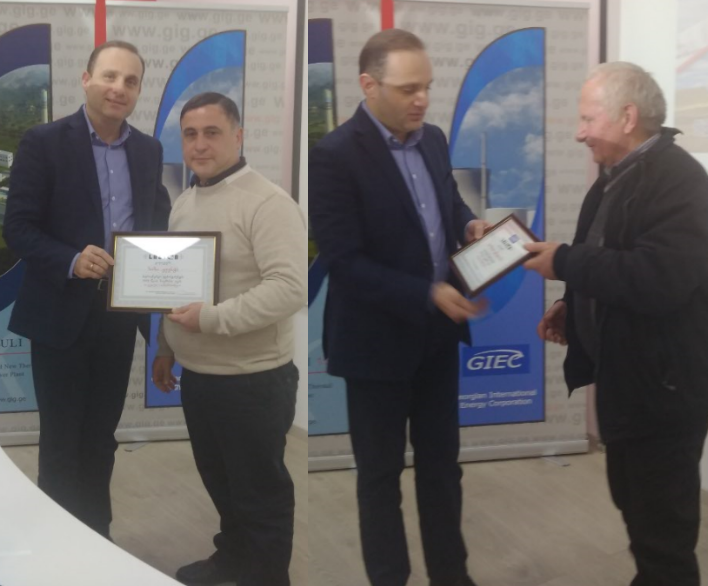 Levan Vepkhvadze, Director General of International Energy Corporation of Georgia awarded the diplomas of gratitude to the best employees of November and December and thanked them for their work. Avtandil Ekseulidze, the operator of the Alazani HPP control unit, who is distinguished with high professionalism and diligence received the title of the best employee of December. One of the main criteria for which he was selected by the company is the rapid response ability during the operational activities, particularly the ability to select the optimal performance modes of the system. The winner of November was Zaza Zhgentia, engineer of Bzhuzha HPP, who actively participated in the process of drying and restoration of 5 transformer systems and implementation of thyristor agitation system. By the initiative of the Director General of the International Energy Corporation of Georgia, the company’s best, distinguished and professional employee for the month will be revealed during the whole year.